Alkè food transport vehicles are used in catering services and for transporting food, drink and ready-to-eat meals in a number of places including airports, hospitals, ports, exhibition centres, historic town centres and home deliveries. 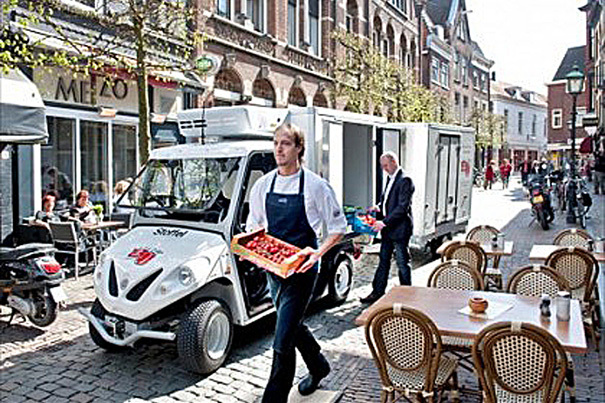 Compact, easy to handle and with zero CO2 and sound emissions, the Alkè catering vehicles have been designed to meet all transport requirements for products and operators. The Alkè catalogue offers you the chance to select two complementary options: the box van and the refrigerated van. Thermally insulated electric box van - The Alkè box van is 3.5 metres lenght and 1.27 metres wide. Due to its compact dimensions, it can offer free access to any area even those that are difficult to get to. But don't be deceived by its size! The van has been designed to optimise its storage space. The box measures 1.80 x 1.26 x 1.23 m and has an internal capacity of 2.8 cubic metres. The structure is also thermo-insulated. This limits heat loss as much as possible and maintains the temperature of food which can be safely transported without affecting its quality. The thermal insulation of our catering vehicles is guaranteed by the specially designed panels comprising the box which guarantee an optimum seal. The box is accessed via four sliding doors on the side that make loading and unloading goods significantly easier. Internal lighting is provided by LED lights and reduces energy consumption even further. The autonomy varies according to the model that the equipment is applied to and you can also select a version with removable batteries: in this way, a charged battery unit will always be available. Alkè catering vehicles also guarantee excellent performance in all Stop & Go operations. This feature makes them especially suitable for transporting meals. 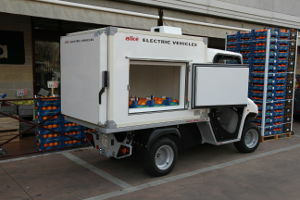 Refrigerated electric van - Alkè Refrigerated Vans are catering vehicles that are ideal when you have to transport perishable food, cakes, meat, fish and fresh products in general. ATP – FRAX certified for food transport, L7e category and type-approved for road circulation, they are fully electric and can freely access Restricted Traffic Zones. The cold storage unit maintains a constant temperature of 0/+4ºC. 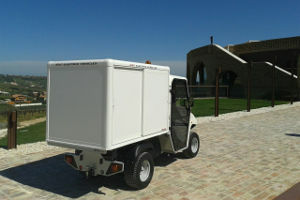 The battery-powered supply also keeps the environment refrigerated during transport. Only 1.27 m wide, they are extremely compact which makes them perfect for deliveries in city centres and areas with limited access. 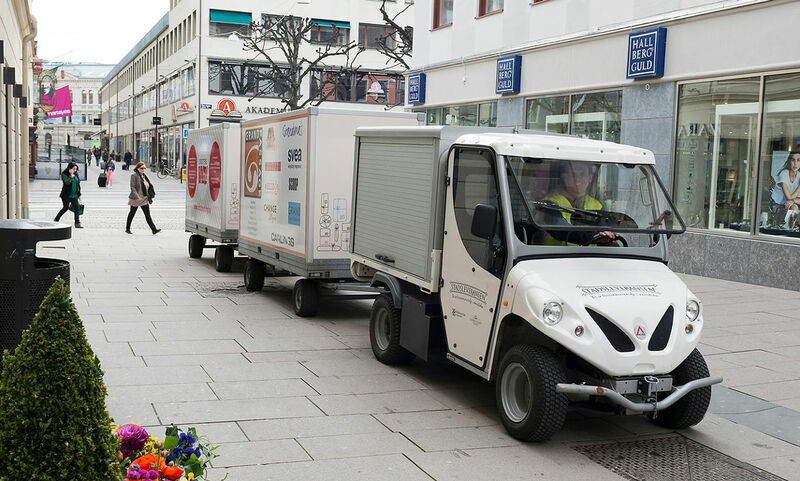 With a load capacity that ranges from 340 to 715 kg and an autonomy that varies from 60 to 90 km depending on the model, Alkè refrigerated electric vehicles make perfect catering vehicles. The specially designed box and use of specific materials guarantee a constant temperature so that they can be used to transport all perishable food and maintain the cold chain at all times. The cold storage unit can be opened from the rear or from the side making it easy for operators to access.